And will update the table in the beginning of September. So, D3 - 1:09.87, some new moves found. And I still pretty believe it can be improved a lot. D2 - 55.75, found new route here. ASPIRINKA wrote: D2 - 55.75, found new route here. 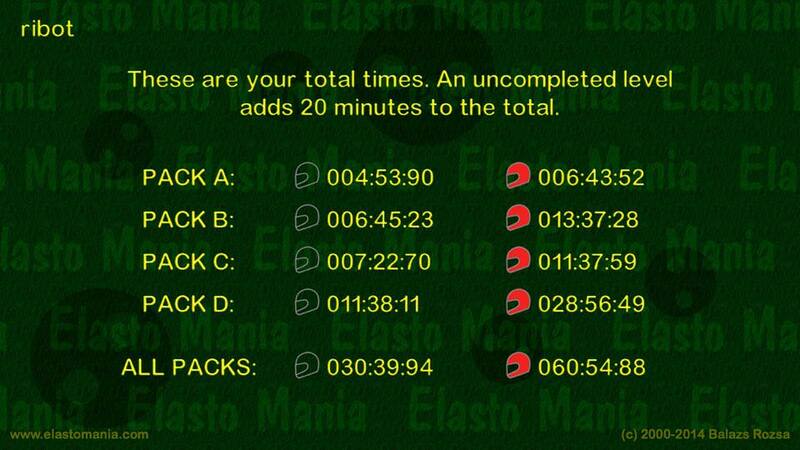 This is the only level (in iELMA) where WR route has been changed four or five times as I remember. A6 - 32.18. Updated the table. Unless you make a specific mobile application for it. And then add the feature to load custom maps stored on the device. I didn't try this feature yet, but it might be useful. Anyway, congratulations with a WR! Do you have rec? Very nice, thanks! Now only B1, B3 and B8 wr recs are missing. Other ones are available by links in the table. 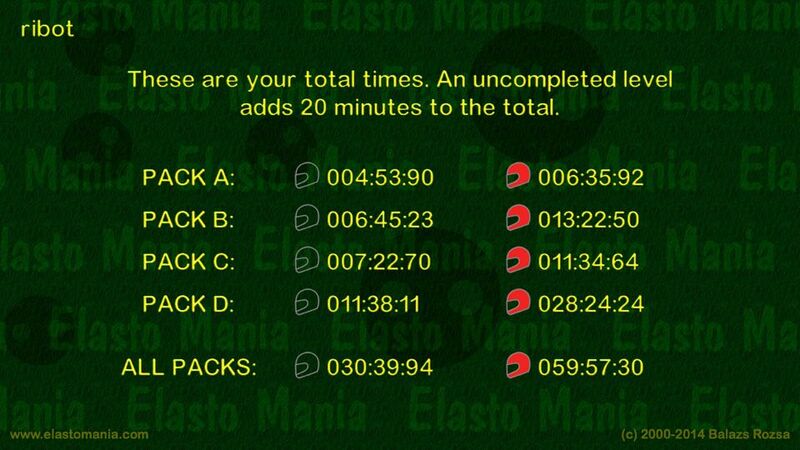 You guys can now buy Elastomania II for pc and dominate the record table until other people will start learning the physics. 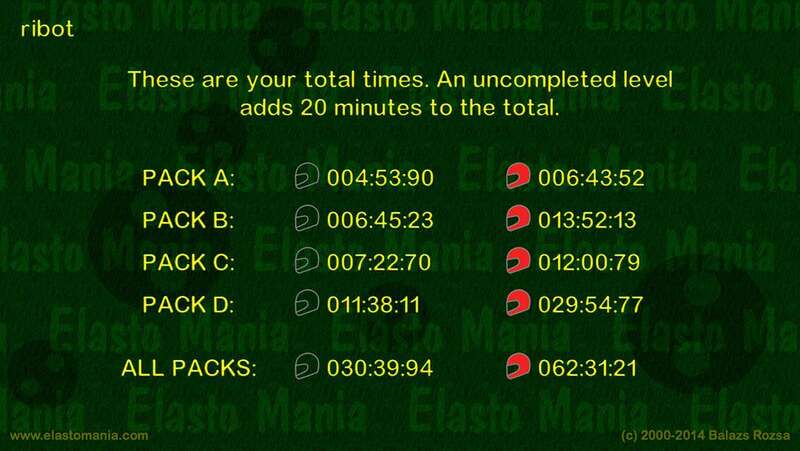 Zero wrote: You guys can now buy Elastomania II for pc and dominate the record table until other people will start learning the physics. Wow, new design! Seems very unusual for me. Was there any reason for updating it? Did anybody complain to the old one? Anyone willing to share the style for B3? WR is 14:03 and I’ve been working on it but the style I use is only getting me 15:03. I can’t see how 1 more second can be lost. Much time has passed since my last update, so here's a big one. It seems nobody cares too much, so I didn't see any point to make it quickly. My current TT is 28:14.13 now. Such big improvements on some levels show how easy these WRs were, especially considering I didn't use any new styles: only h¨øyling and some new micro moves on a few levels. And I think the new ones aren't much harder. It seems just nobody cares already. And WRTT is 27:55.41 now, so, yeah!!! But it's sad to see only 3 ppl in the table remained, and one of them has only 1 WR, so, as I told before, nobody really cares. Finally, I uploaded all my current best times to my channel. This is the first time I tried to use phone for recording, so, now they have sound and quality seems to be better, so, enjoy! This includes all my new WRs listed above plus old WRs mentioned in previous posts but haven't been uploaded yet: A2, B5, B7, B8, and C2. Also I added my improvements on A5 and B1 levs, which aren't WRs. All iOS table video links are updated to these videos. Red hat limit break. First person in known universe to go under 60.